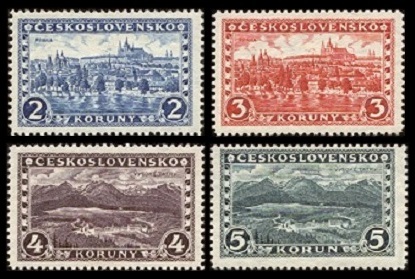 New pictorial definitive Czechoslovakia stamps were introduced in 1926. These new definitive postage stamps, with only a couple exceptions, all feature famous Czechoslovakian landmarks and landscapes. Attractive definitive postage stamps of this nature would be the trend for Czechoslovakian issues well into the 20th Century. Paper with the horizontal Linden Leaves watermark (WMK 107), shown above, was used for printing the definitive stamps of 1926 to 1927. The use of paper with this watermark was discontinued in 1927. The three high-denomination definitive Czechoslovakia stamps shown above were issued on June 1, 1926. They are all engraved on paper with WMK 107, and they are perforated 10. The common design features a view of Karlštejn (Karlstein) Castle. 1.20 K. (1926 - Sc. #109) - Karlštejn Castle - Red Violet. 1.50 K. (1926 - Sc. #110) - Karlštejn Castle - Carmine Rose. 2.50 K. (1926 - Sc. #111) - Karlštejn Castle - Dark Blue. 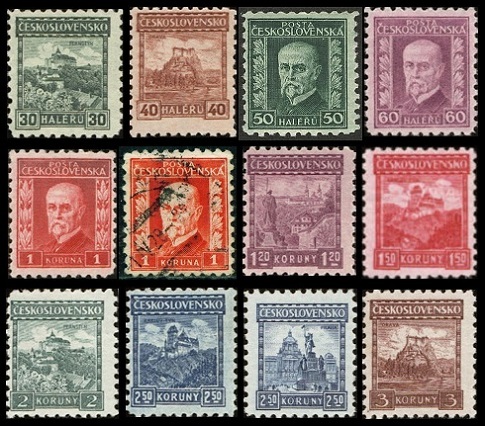 The nine definitive Czechoslovakia stamps shown above were issued between 1926 and 1927. They are all engraved on paper with WMK 107. 30 H. (1926 - Sc. #114) - Pernstein Castle - Gray Green. 40 H. (1926 - Sc. #115) - Orava Castle - Red Brown. 50 H. (1926 - Sc. #116) - Thomas Masaryk - Deep Green. 60 H. (1926 - Sc. #117) - Thomas Masaryk - Red Violet. 1.20 K. (1926 - Sc. #118) - Strahov Monastery - Red Violet. 2.00 K. (1926 - Sc. #119) - Hradcany at Prague - Blue, Ultramarine. 3.00 K. (1926 - Sc. #120) - Hradcany at Prague - Deep Red. 4.00 K. (1927 - Sc. #121) - Tatra Mountains - Brown Violet. 5.00 K. (1927 - Sc. #122) - Tatra Mountains - Dark Green. 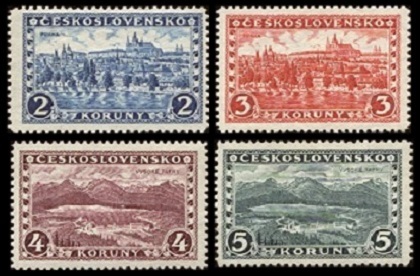 The first horizontal coil-format Czechoslovakia stamps, shown above, were issued in 1926. They are all engraved on paper with WMK 107, and they are perforated 10 vertically. 20 H. (1926 - Sc. #123) - Karlštejn Castle - Brick Red. 30 H. (1926 - Sc. #124) - Pernstein Castle - Gray Green. 50 H. (1926 - Sc. #125) - Thomas Masaryk - Deep Green. The 20 H. and 30 H. denominations exist in vertical pairs, imperforate horizontally. 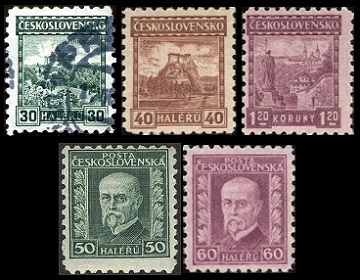 Pictorial definitive type Czechoslovakia stamps of 1925 to 1929, shown above, were produced between 1927 and 1931. These new stamps are engraved on unwatermarked paper. 30 H. (1927 - Sc. #126) - Pernstein Castle - Gray Green. 40 H. (1927 - Sc. #127) - Orava Castle - Deep Brown. 50 H. (1927 - Sc. #128) - Thomas Masaryk - Deep Green. 60 H. (1927 - Sc. #129) - Thomas Masaryk - Red Violet. 1.00 K. (1927 - Sc. #130) -Thomas Masaryk - Carmine Rose. 1.00 K. (1927 - Sc. #131) -Thomas Masaryk - Deep Red. 1.20 K. (1926 - Sc. #132) - Strahov Monastery - Red Violet. 1.50 K. (1929 - Sc. #133) - Karlštejn Castle - Carmine. 2.00 K. (1929 - Sc. #134) - Pernstein Castle - Deep Green. 2.50 K. (1927 - Sc. #135) - Karlštejn Castle - Dark Blue. 2.50 K. (1929 - Sc. #164) - Statue of St. Winceslas and National Museum in Prague - Deep Blue. 3.00 K. (1931 - Sc. #136) - Orava Castle - Red Brown. 2.00 K. (1927 - Sc. #137) - Hradcany at Prague - Ultramarine. 3.00 K. (1928 - Sc. #138) - Hradcany at Prague - Deep Red. 4.00 K. (1928 - Sc. #139) - Tatra Mountains - Brown Violet. 5.00 K. (1928 - Sc. #140) - Tatra Mountains - Dark Green. 20 H. (1927 - Sc. #141) - Karlštejn Castle - Brick Red. Karlštejn (Karlstein) Castle was founded in 1348 by the King of Bohemia and the future Holy Roman Emperor, Charles IV (1316-1378). The castle has been used over the centuries for the safekeeping of the crown jewels, holy relics, and other royal treasures. It is located about 18 miles Southwest of Prague. Pernstein Castle was founded c. 1270 by the Lords of Pernštejn (Pernstein), one of the most affluent Czech families of the time. It was completed during the 16th Century. 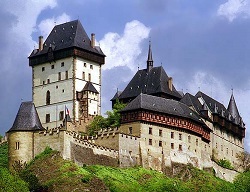 The castle, located in South Moravia, is now the property of the Czech Republic. 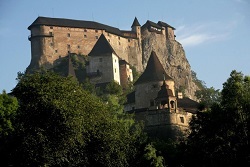 Orava Castle, located in Slovakia, was built during the 13th Century. Until the 19th Century, the castle was a private residence. Today, it is a Slovakian national monument and museum. The 1922 movie, Nosferatu, was filmed there. 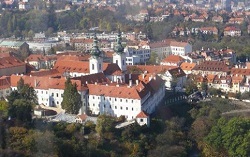 The Strahov Monastery, located near Prague, Czech Republic, was originally founded in 1143. It is noted for its philosophical and theological library and for the Basilica of Our Lady.